Duke brings MotoGP fans the official, comprehensive reviews of the awesome MotoGP title chase, as well as the final season of 250cc racing and the knife-edge 125cc championship battle. The DVDs feature footage delivering every vital highlight from 2009, plus bonus features. The 2009 MotoGP season produced a thrilling battle for the World Championship as seasoned campaigner Valentino Rossi battled his young Fiat Yamaha teammate Jorge Lorenzo for the sport’s biggest prize. The Official DVD Review brings fans the comprehensive story of the third season of the 800cc class, with action-packed coverage of every race – from the spectacular opening round under the floodlights of Qatar to the season finale in Valencia. Breathtaking race footage charts the title chase as Rossi fights every step of the way to capture his ninth World Championship, and Lorenzo challenges his illustrious teammate in the hunt for his first MotoGP crown. Plus, we witness the heroics of Honda’s injury-hit Dani Pedrosa and Ducati star Casey Stoner, who was sideline by illness. Despite their woes, the determined pair gave it their all to produce some stunning results in the fight for third in the championship standings. The Official DVD Review features all the epic battles, vital moments, action-packed racing and shocking crashes from an incredible season of the MotoGP World Championship. Plus, bonus features include an exclusive interview with 2009 MotoGP World Champion Valentino Rossi and complete on-board laps of all 17 circuits featured in the 2009 championship. 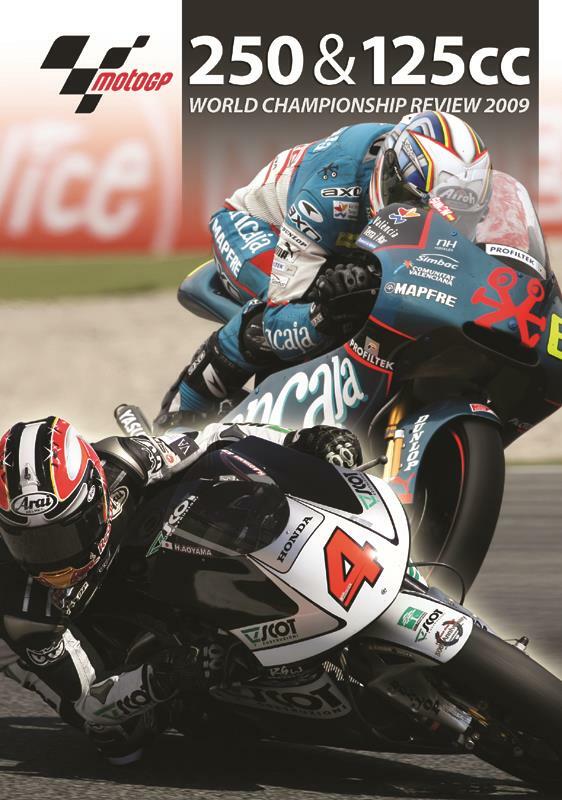 Fans can also enjoy action-packed highlights from an historic and thrilling year for the 125cc and 250cc MotoGP classes. The Official DVD Review brings you all the best moments of racing, most stunning battles and the most spectacular action from two scintillating title chases. It was the last year for the 250cc engines before the launch of a fascinating new era, and the class signed off in style with an edge-of-the-seat World Championship battle which would go right down to the very last round. Defending champion Marco Simoncelli gave it his all on the Metis Gilera to ensure his season-long clash with Scot Racing’s Hiroshi Aoyama would last to the final race of the season, setting up a thrilling climax to mark the end of the 250cc era. After two disappointing seasons in the 250cc class, Julian Simon was determined to make his mark back on the 125cc machines – and he did it in style. Despite the determined effort of his hard-charging Bancaja Aspar teammate Bradley Smith, the Spanish star would roar to a convincing World Championship win. The Official DVD Review brings fans every vital highlight, featuring the most dramatic action footage to create a comprehensive look back at an exceptional and historic year of racing. Plus, bonus features include interviews with both the 125cc and 250cc World Champions and a look ahead to the new era of Moto2. As well as the Official Reviews of all the racing action, Duke is also offering fans a chance to explore the development of today’s Grand Prix machines in the fascinating documentary MotoGP Evolution of a Species, featuring race footage, behind-the-scenes access and interviews with the stars of Grand Prix racing. 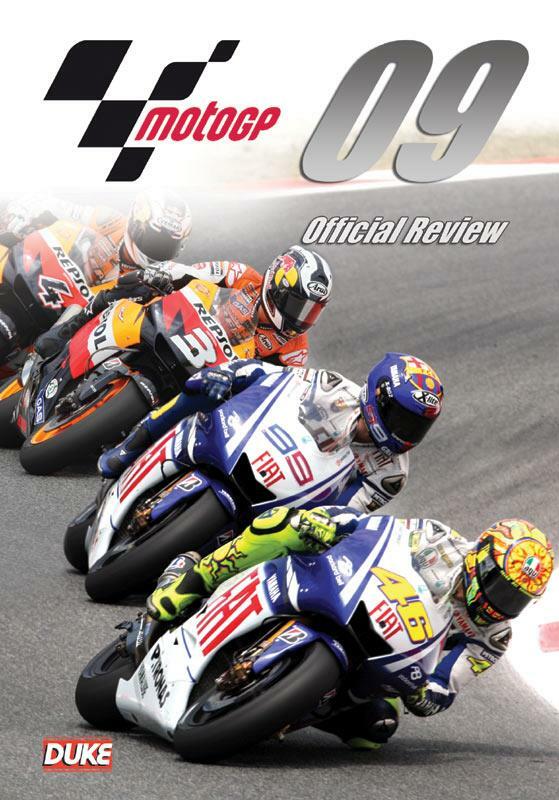 Official MotoGP Review 2009 is released 14 December 2009 and MotoGP 125/250 Review 2009 is released 21 December 2009 on DVD, priced at £24.46 (each) and will be available from leading video outlets or direct from Duke Video on 01624-640000.